Steve Gaunt, a member of the Arctic Trucks UK team and a man with three decades of off-road experience behind him, wandered over and told me that while the offside rear wheel of the Toyota Hilux AT37 I was driving was waving a couple of feet in the air, he was pretty sure that the situation would improve if I just carried on, writes Carlton Boyce. And, he added with a grin, he thought we’d be able to make the switchback turn in one go rather than having to shuffle to-and-fro like everyone else had. If I wanted to those precious style points – and who wouldn’t? – all I had to do was follow his hand signals and put my faith in Icelandic engineering. This was my introduction to the Traversee du Champsaur, a 200km jaunt through the French Alps organized by the GRM, or Grands Randonneurs Motorisés, a local off-road club that specializes in organizing this sort of adventure. You might already be familiar with the Arctic Trucks name through the Top Gear TV special in which James May and Jeremy Clarkson drove a similarly modified pickup to the magnetic North Pole, a staggering feat only made possible by the experience the Icelandic firm had gained during years of Polar travel in Antarctica and other hellish environments. I’ve long been a fan of the firm’s work, a state of affairs that peaked with the purchase of my own Isuzu D-Max AT35. Lifted, pumped up and running 35-inch tyres (hence the name), it is ridiculously over-engineered for the sort of work I ask of it and all the more glorious for it. So, when Steve asked me if I’d like to come along and drive Arctic Trucks’ latest project, I jumped at the chance. Steve bought this particular vehicle after it had been used by Arctic Trucks to get the Toyota Hilux AT35 through the European homologation process. This legislative hurdle, only undertaken by major car manufacturers, means the Arctic Trucks Hilux can readily be sold as a turn-key showroom model. Most companies would have left it there but the temptation to fit bigger tyres and an even more extreme suspension system proved irresistible; the car disappeared into the bowels of the Arctic Trucks’ workshop only to emerge a couple of weeks later with 37-inch tyres, a £4,000 Old Man Emu suspension lift, flared wheelarches, re-geared front and rear differentials, and natty AT37 decals. 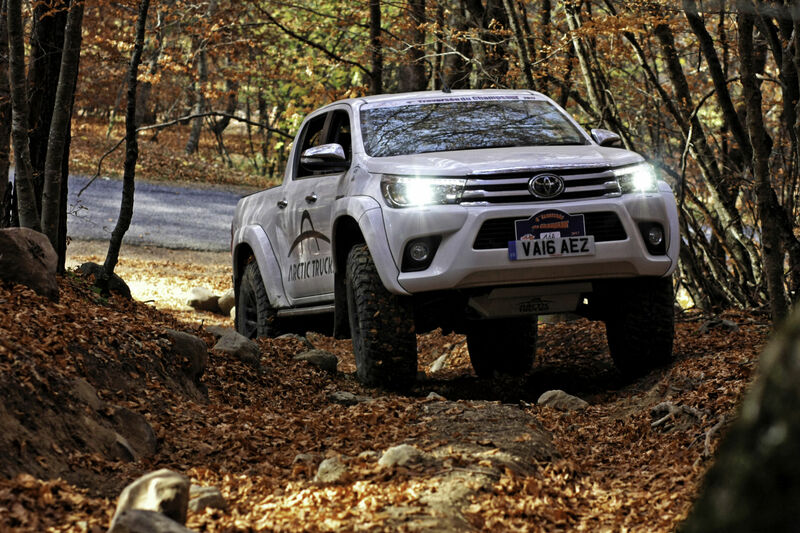 Simply getting to the start line would be the first challenge; the 850-mile journey from Arctic Trucks’ UK base in Warwick to Orcières in the south-east of France would be a long slog in something low, comfortable and quiet – and a highly-modified Toyota Hilux fitted with 37-inch mud tyres and a hefty suspension lift would, in my experience, be anything but. The changes should have made it a dreadful motorway cruiser and an even worse backroads weapon, but the reality is that the wider tyres and beautifully engineered, fully adjustable suspension actually make the modified pickup easier to thread along twisty roads than the standard, factory fresh model and while the aggressive mud tyres might hum a little at high speeds, the levels of NVH (noise, vibration and harshness) they generate are more than acceptable, even at the sort of speeds that leave you hyper-vigilant for patrolling Gendarmerie. A gentle two-day run down through France to Orcières left us fighting fit and ready to do battle with whatever the Alps could throw at us. Saturday morning’s driver briefing was conducted in French but the essence seemed to be that we should not drive in convoy with any of the other competitors and should slow down when passing through any villages; while the entire route would be run on public roads and public rights of way, environmental concerns demanded an understanding attitude if we weren’t to jeopardize future events. Other than that, we were told to simply have fun. All very laidback, and delivered to a background haze of cigarette smoke and strong coffee. Obviously. The vehicles themselves were an eclectic bunch; an aftermarket four-wheel-drive Citroen 2CV sat next to a purpose-built, highly tuned Ibex fitted with a Jaguar engine. Other drivers might have chosen more conventional vehicles to compete in but their investment varied considerably from a sub-£1000 Suzuki X-90 ll the way to a six-figure Mercedes G-Wagen complete with a dedicated trailer to carry his spare wheels and tyres. Pre-event preparations for most were pretty much limited to applying event stickers and letting some air out of the tyres to improve the ride and help give more grip on the rockier sections; Steve shrugged in a very Gallic fashion when I mentioned this and suggested that this would probably be unnecessary in our case. He did soften the suspension settings, although that change was made, I suspect, more out of curiosity than anything else. The 200km route was spread over two days with tarmac and gravel forestry roads linking the tricky, technical sections; while some of the tracks could have been driven in a VW Polo, any cockiness I might have felt at times was invariably replaced by apprehension when I read the words “montee raide” on our pace notes. A literal translation might be ‘steep climb’ but the reality is the words signified the sort of terrain a goat would struggle to walk up – and while the pros might relish that sort of challenge (although Nick, the driver of a drool-inducing Jeep Rubicon, told me that a montee raide is small beer: a montee montee raide is where all the fun lies, apparently…) it’s a very different matter when you’re driving someone else’s pride and joy. The approach taken on the more difficult sections was tailored to suit the limitations of the vehicles: some drivers walked the course before tip-toeing through the obstacles, while others preferred to dispatch the rough stuff in a blur of twirling hands and foot-to-the-floor heroics. The diminutive Suzuki X-90 was firmly in the latter camp, its driver using momentum and a Zen-like calm to will it up even the steepest, rockiest hill. The fact that its price made it practically disposable probably helped. Our Arctic Truck managed everything at an amble, its long-travel suspension and wide, aggressively cut mud tyres enabling it to traverse everything the Alps could throw at us with little drama and at little more than tickover. In fact, the only problems we had were caused by its width; the narrow Alpine tracks were more used to be navigated by stock four-wheel-drive vehicles than something that could conquer the North Pole in showroom specification. Lunch was, on both days, a leisurely affair, comprising three courses and plenty of wine for those not driving. The emphasis was as much on the social side as the driving, which eased the pressure on those of us for whom this was their first event; even getting stuck seemed to be an occasion for some well-judged banter from the spectators while they delivered physical assistance. The journey home was a one-hit blur of Red Bull, strategically negotiated speed limits, and, in the end, more than a hint of white line fever. I rolled into my home in north Wales just before midnight, still staggered at the towering competence of the Toyota Hilux AT37 I had been driving for the past few days. Next Post: Dry January: What happens to your body when you stop drinking alcohol?